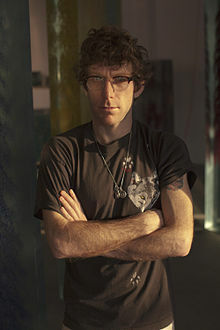 Dustin Yellin (born July 22, 1975 in Los Angeles, California) is a contemporary artist living in Brooklyn, New York. He is best known for sculptural paintings that use multiple layers of glass, each covered in detailed imagery, to create a single intricate, three-dimensional collage. His work is notable both for its massive scale and its fantastic, dystopian themes. Yellin is the founder of Pioneer Works, a not-for-profit cultural center, in Red Hook, Brooklyn. Yellin's work has been exhibited worldwide. Notable American locations include Lincoln Center, the Kennedy Center in Washington, D.C., and a permanent public installation on Sunset Boulevard in Los Angeles. Since 2016, Yellin has been working with Google to develop creative, user-directed virtual reality technology. In 2017, Yellin assembled 10 Parts at GRIMM Gallery in Amsterdam. Yellin was born in Los Angeles in 1975. When he was five years old, he and his mother, a wealthy real estate entrepreneur, moved to Telluride, Colorado. A "congenital outsider," he attended high school in Colorado, but left before graduation because "I wasn’t learning about what I wanted to do". He spent a year studying with a physics instructor, absorbing both the scientific method and an eccentric approach to knowledge. At the physicist's urging, Yellin experimented with hallucinogens. "I felt like I had exploded through the universe—like I had been reduced to a single cell.” Yellin believes this experience helped shape his artistic worldview and commitment to social change. Science and consciousness became pivotal themes. His education was rounded by extensive travel to remote places, trips which revealed the bizarre and eccentric in the everyday. Yellin arrived in New York City in 1995. A complete stranger to the area, he took to break dancing on sidewalks to help make ends meet. Within months, he met a broad range of creative, talented individuals who influenced and informed his work. In 2005, His first solo exhibition was at James Fuentes. Yellin began working with paint and collage. His early work, described as "psycho-repetitious drawings of multi-cellular entities", reveals a preoccupation with the patterned diversity of the natural world. In 1998, Yellin was apprehended by police for trespassing on a Central Park monument. He had become convinced "everybody knew each other" and believed his hi-jinks would be forgiven by a friendly peace-keeping force. Subsequently, a video of the incident appeared, "a total psychotic break captured on film." In 2002, Yellin was working outdoors on a collage, attaching natural materials to canvas with resin, when a bee landed on the center of the piece. Immediately, he poured enough resin to quiet the insect, capturing it entirely. Once the resin dried, Yellin continued to embellish the piece. This apparently mundane accident was a breakthrough, spurring Yellin to further develop the possibilities of resin. He began to pour successive layers to render transparent, multidimensional forms by stacking flat planes of images, one on top of another, to create the effect the bee inspired, of a "hologram trapped in amber." Yellin cites Jean Dubuffet, Joseph Beuys, and Joseph Cornell as artistic influences. His early work is a phantasmagoric extension of the taxonomic art of the 19th century, focusing on otherworldly mutations of living things, especially plants and insects. Later, larger-scale works translate the mythic, monumental lyricism of ancient cities like Petra, Machu Picchu, and Angkor Wat into a premonitory vernacular. Yellin describes his anthropomorphic Psychogeographies as products of the imagistic DNA of cultural myth that harmonize with magical reality. Yellin's work pushes the boundaries of his materials. To construct larger pieces, Yellin enlisted architect and engineer Tony Durazzo. Soon he was using a forklift in his production process. In 2011, Gabriel Florenz, Yellin’s Director of Operations, was injured during transport of a piece when it fell and nearly severed two fingers of his hand. The use of resin allowed Yellin to immerse found objects in layered planes of collage. "This was great," says Yellin in his 2015 TED talk, "except for one thing: I was going to die." The poisonous resin forced Yellin to wear a hazmat suit for protection from the vapors. This danger led Yellin to shift from resin to glass panels. The flatness of the glass changed the work. Yelling could edit, rearrange, and better plan compositions. He culled clippings from mid-twentieth century reference texts and scientific materials, assembling them into images both recognizable (an animal's torso, a human body) and imaginary (a monstrous bird pinioned to a battleship). 10 Parts (2017) is an oracle of hallucinatory apocalypse, a cautionary tale of chaos and crisis charting humanity's fall from mountainous height to oceanic hollow in an entomological twenty-foot cascade of panels. The Triptych (2014) is Yellin’s largest sculpture, a massive 12-ton, three-paneled meditation upon the world and human consciousness. Psychogeographies (2012–present) are a series of life-size humanoids of reanimated cultural detritus whose DNA is, in Yellin's words, the "captured and frozen 'dynamism' of a culture." Little Grandfather (2007-2014) is a documentary film Yellin co-directed with photographer Charlotte Kidd. The film depicts the shamanistic healing practice of the Achuar, a once-cannibalistic Amazonian tribe with a shamanistic, polygamous culture. The film was given limited release in 2014. Arboreum (2009) features a forest of eight to nine-feet-tall glowing trees and multiple twelve-foot-long sections of a wildflower field. Yellin moved his studio to Red Hook, Brooklyn in 2005. He occupied several increasingly larger buildings, beginning with a single story site on the corner of Van Brunt and Commerce Streets. Larger works spurred a move to 133 Imlay Street, a sprawling space that hosted both his studio and a joint venture between Yellin and Charlotte Kidd, The Kidd Yellin Gallery. In 2011, Yellin purchased the three-story brick warehouse structure originally built as Pioneer Iron Works in 1866. The building required renovation and restoration. With the aid of architect Sam Trimble and Gabriel Florenz, Yellin created a ground floor exhibition space with a forty-foot ceiling, offices, and nearly a dozen studios on the second and third floors. Half of the acre site, originally a concrete slab and junkyard, became a garden. Pioneer Works is an independent, not-for-profit cultural and educational resource unlike traditional institutions. Yellin leased another large space nearby to serve as his studio. Yellin is Founder and Director and Florenz, his longtime right-hand, is Director. Pioneer Works holds public exhibitions, screenings, concerts, readings, as well as lectures and courses on a range of artistic, scientific, and social topics. Pioneer also awards multiple no-cost arts and science residencies each year. Yellin leased another large space nearby to serve as his studio. As a working artist, Yellin is considered unusual for founding and supporting a community where emerging artists collaborate with creatives from diverse disciplines to inspire social change. At the TED Conference in Vancouver in 2015, Yellin was invited to speak about both his own design methods and his belief in the revolutionary potential of collaboration. He is often asked to speak and write on cultural, scientific, and environmental issues for a range of audiences. ^ "Dustin Yellin adds his mark in L.A. with art that's a 'missile for social change'". latimes.com. Retrieved January 11, 2017. ^ "One Celebrated Brooklyn Artist's Futuristic New Practice". nytimes.com. Retrieved January 11, 2017. ^ "10 Parts". grimmgallery.com. Retrieved January 11, 2017. ^ "Inside Dustin Yellin's Brooklyn Factory of Delights". vanityfair.com. Retrieved October 1, 2016. ^ "Inside Dustin Yellin's Brooklyn Factory of Delights". vanityfair.com. Retrieved January 11, 2017. ^ "Robertmiller Gallery". www.robertmillergallery.com. Retrieved September 15, 2016. ^ Shuster, Robert (May 6, 2009). "Dustin Yellin's 'Dust in the Brain Attic'; Coke Wisdom O'Neal at Mixed Greens; Sophie Calle's 'Take Care of Yourself'". www.villagevoice.com. Retrieved September 15, 2016. ^ "A Red Hook Tale of Domesticity". NYMag.com. Retrieved September 15, 2016. ^ "Artist Dustin Yellin Opens His First Permanent Installation On Sunset Boulevard". architecturaldigest.com. Retrieved January 11, 2017. ^ "Dustin Yellin, A Journey Through The Mind Of An Artist". ted.com. Retrieved January 11, 2017. ^ "Psychogeographies: 3D Collages Encased in Layers of Glass by Dustin Yellin". thisiscolossal.com. Retrieved January 11, 2017. ^ "Dustin Yellin's Modern Community-Building". newyorktimes.com. Retrieved January 11, 2017. ^ "It's About Time". edge.org. Retrieved January 21, 2017. ^ "Eden Disorder". Archived from the original on February 5, 2015. Retrieved March 9, 2010. ^ "Unnatural Selections". Archived from the original on February 6, 2009. Retrieved June 19, 2009. ^ "Permutations". Archived from the original on September 1, 2009. Retrieved June 19, 2009. Shedding History's review of "Eden Disorder"
Village Voice: Your Face or Mine? This page was last edited on 26 March 2019, at 16:23 (UTC).